Chris Phan from Rosalynn Carmen on Vimeo. Chris Phan wears many hats – Garden Grove City Councilman, Orange County Deputy District Attorney and lieutenant commander with the U.S. Navy’s Judge Advocate General’s Corps. But he wears only one thing on his sleeve – the Asian and Pacific Islander community. 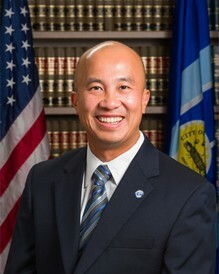 Phan’s unique accomplishments have earned him the 2013 Asian Heritage Award in Government. He and 11 others in their respective categories will be honored along with UCSD Chancellor Pradeep Khosla at the Tenth Annual Asian Heritage Awards Sept. 14, 2013, at the San Diego Marriott Marquis and Marina on Harbor Drive in downtown San Diego. Phan immigrated to the United States from Vietnam when he was nine years old. His family and he settled in Carmel, Indiana. After high school, he attended college at Indiana University. Thereafter, Chris attended Southern Illinois University School of Law where he was editor of the school's law journal. Chris graduated from law school in 1999 and joined the Navy Judge Advocate General's Corps after he passed the Illinois Bar. After completing Officer Indoctrination School and Naval Justice School in Newport, Rhode Island, Chris reported to Naval Legal Service Office, Branch Office Earle, New Jersey in April 2001 for his first tour of duty. At Earle, Chris served as defense counsel, legal assistance attorney, and Branch Head. Upon his return to California from Iraq and passing the California Bar, Chris resigned from active duty in June 2008, and opened his own law firm. He was also the President and founding member of the Vietnamese American Armed Forces Association (VAAFA). VAAFA consists of Vietnamese American service members from all branches of the United States military. It is a professional networking and community service association. In 2010, Chris was recalled to active duty for one year to serve as legal counsel for our wounded troops in the Wounded Warrior program at the Portsmouth Naval Hospital in Norfolk, Virginia. In 2012 he was elected to the City Council of Garden Grove, California. In the last ten years, the Asian Heritage Society’s Asian Heritage Awards has become the premiere event of its kind for Southern California’s Asian community and has been recognized by the U.S. Congress, the City and County of San Diego and twice cited for its public service by the San Diego Press Club, one of the largest organizations of its kind in the country. Principal sponsors include SDG&E, the U.S. Navy, the Avery-Tsui Foundation, and Barona Resort and Casino.